German military records have been found in a Polish government archive in Warsaw revealing that Michael Chomiak (lead image, left), maternal grandfather of Canadian Foreign Minister Chrystia Freeland (right), volunteered to serve in the German invasion of Poland long before the German Army attacked the Soviet Union and invaded Ukraine. Chomiak’s records show he was trained in Vienna for German espionage and propaganda operations, then promoted to run the German press machine for the Galician region of Ukraine and Poland during the 4-year occupation. So high-ranking and active in the Nazi cause was Chomiak that the Polish intelligence services were actively hunting for Chomiak until the 1980s – without knowing he had fled for safety to an Alberta farm in Canada. The newly disclosed documents expose Freeland’s repeated lying that Chomiak had been a victim of World War II; an unwilling journalist overpowered by German military force; compelled to write propaganda extolling the German Army’s successes, and advocating the destruction of the Jews, Poles and Russians. As for Freeland’s claim that Chomiak had secretly aided the Ukrainian resistance, sources in Warsaw believe Chomiak was trained by the Germans as a double-agent,penetrating Ukrainian groups and spying on them. The Polish records also point to the likelihood that US Army, US intelligence and Canadian immigration records on Chomiak – concealed until now – can confirm in greater detail what Chomiak did during the war, as well as for years afterward, which made him a target for the Polish police until not long before his death in 1984. 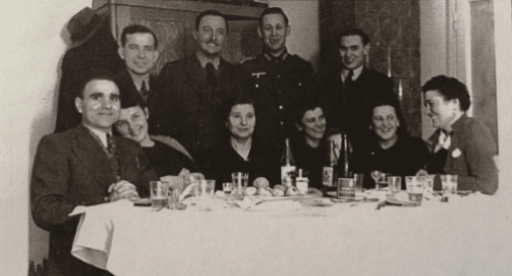 Chomiak (rear, left) with a German officer and a different group of officials of the Generalgouvernement in Cracow. The source for the photographs is Ukrainian-Canadian researcher Alex Boykowich, who has reported his findings from the Chomiak archive here. Following her promotion to foreign minister in January of this year, Freeland repeated the lies after historians and reporters opened Chomiak’s personal papers at the Alberta province archives. The Chomiak papers can be found at accession number 85.191. Click to open. The papers reveal Chomiak’s enthusiastic writing in wartime media in Cracow and Chelm, as the German concentration camps nearby at Belzec, Majdanek, Sobibor and Auschwitz destroyed the populations of the Polish cities, of Jewish Lvov (Lviv), and of the Galician region which Chomiak sought to cleanse for his vision of Ukrainian independence, backed by German arms. For details of the story, and of the Canadian and Ukrainian evidence published so far, read this. The 14th Waffen-SS Grenadier Division was formed by Heinrich Himmler in mid-1943 from 80,000 Ukrainian applicants. Just 13,000 were selected and the rest used to form police units and guards for the concentration camps. The destruction of the German armies around Stalingrad by early 1943 left the German forces on the eastern front severely undermanned; Chomiak’s job included helping to raise the new force and ensure its recruits would remain loyal to the Nazis. For background, read this. As controversy has intensified in Canada over Freeland’s coverup for Chomiak, she arranged in the parliament lobby for a reporter to ask the question Freeland’s staff had planted: “Recently, there has been a series of articles about you and your maternal grandparents making accusations that he was a Nazi collaborator in pro-Russian websites. I’d like to get your view on do you see this as a disinformation campaign by the Russians to try to smear you and discredit you? Which they have to have a tendency to have done.” In answer Freeland avoided the Chomiak evidence. Instead, she blamed Russian efforts “to destabilize” the US and Canadian political systems. “I am confident”, Freeland declared on March 6, “in our country’s democracy, and I am confident that we can stand up to and see through those efforts.” For the full story, click. On March 9 Freeland was reported in the Washington Post as saying: “Russia should stop calling my grandfather a Nazi”. 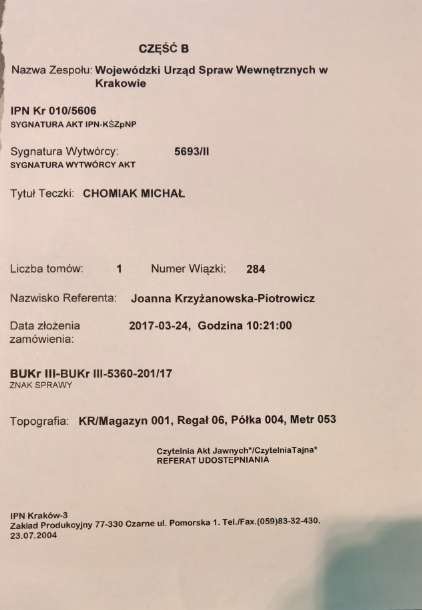 In Warsaw, a file on Chomiak has been discovered at the Institute of National Remembrance (IPN is the Polish acronym), which is part of the state’s Commission for the Prosecution of Crimes against the Polish Nation. There are four items in the file, which have been photographed, and are published here for the first time. The IPN has tagged the Chomiak file No. Kr 010/5606. 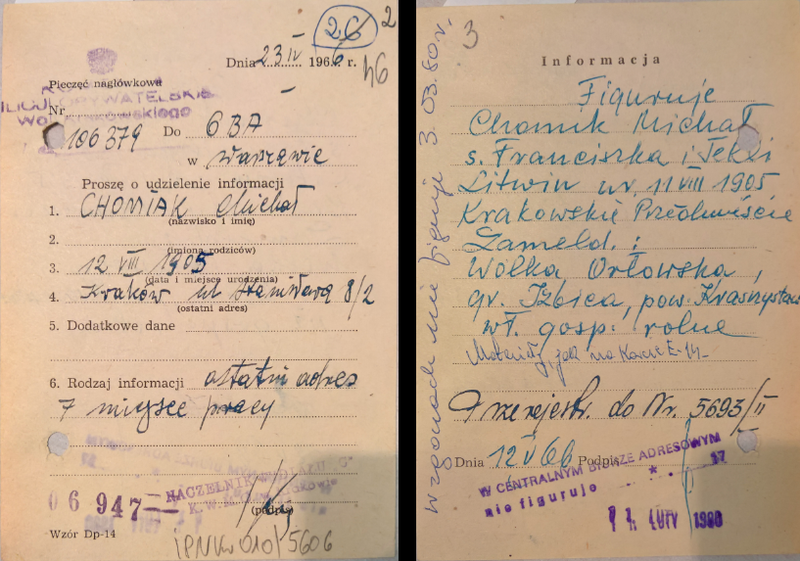 The three original documents in the file comprise Chomiak’s identity card of 1941, issued by the German authorities; and two later documents in Polish, indicating a Polish intelligence and police search for Chomiak. The document shows that Chomiak, then 36 years old, was in Vienna at the time the German authorities issued his identification. He was no longer a reporter or journalist, but titled Hauptschriftleiter – Editor in Chief. The card also confirms that although a Ukrainian by nationality, and a native of Lemberg (the German name for Lvov), Chomiak had been living and working for some time in Cracow, then occupied Poland. Cracow was the administrative capital of the Generalgouvernment, whose governor-general was a German, Hans Frank. Gassner, whom Chomiak’s own papers identify as his boss, was Frank’s spokesman and head of press operations for the Galician region. Polish analyst Stanislas Balcerac points out that before Chomiak was granted his new Kennkarte (identity card) No. 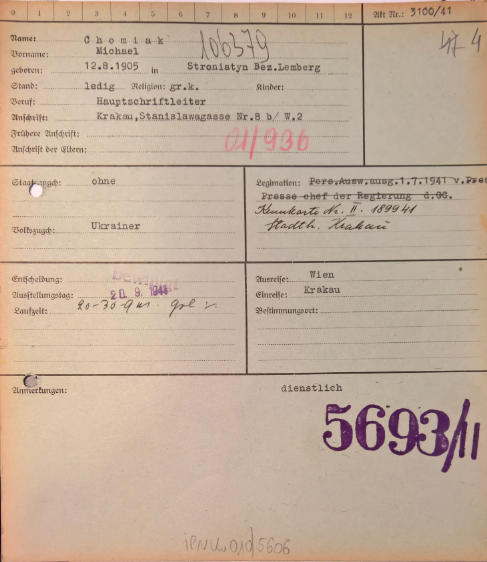 II 189941 for living and working in Cracow, the Germans had already granted him a Personal Ausweis (ID card), dated July 1, 1941. That had been issued by the Presse chef der Regierung (Government Head of Press) – that was Gassner (below, right). 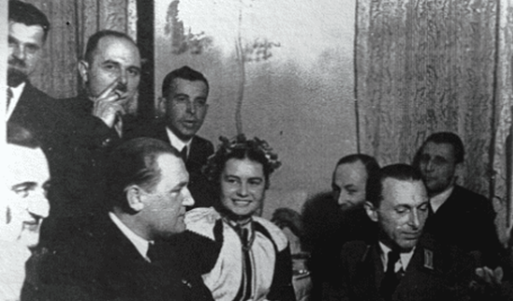 Hans Frank (centre) and Emil Gassner (right) at the opening of the German Press Centre in Cracow, March 1942. 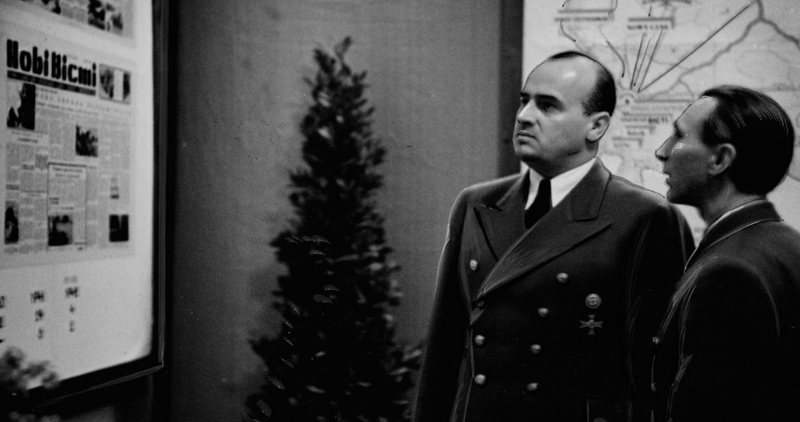 Frank was convicted at Nuremberg for war crimes and executed in October 1946; Gassner testified at the trial on Frank’s behalf. By that time Chomiak was working for US Army Intelligence in Bavaria. The German administration of Galicia commenced in Cracow in November 1939. The invasion of the Soviet Union began on June 22, 1941, and one week later, on June 29, 1941, German forces captured Lvov (Lviv). The entire Galician region north and east of Lvov was then incorporated into Frank’s governorate. By that time Chomiak was at work in Cracow for Gassner. He hadn’t fled the Ukraine from the Germans, as Freeland, Canadian Broadcasting Corporation, and the Canadian press claim. Chomiak fled to the Germans, slipping across the Ukraine border, running from the Soviet government of the Ukraine towards German rank, power, and money, including an apartment and furniture taken from Jews who had been sent to their deaths at Belzec. The papers Chomiak left behind at his death in Canada do not reveal what he was doing with the Germans in the 2-year interval. Polish sources suspect Chomiak arrived in Cracow soon after Frank became governor, offering himself as an agent of influence to inform the Germans on what fellow Ukrainians and anti-Russian nationalists then active in and around Lviv were thinking and planning. His work as a journalist was a cover for espionage on behalf of the Germans, Polish sources suspect. 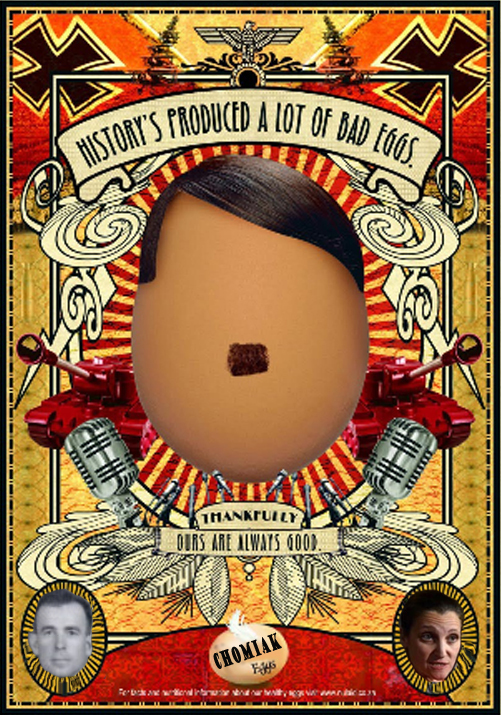 There is no corroboration for this in the Polish files discovered to date. Two other documents in the IPN dossier, dating well after the German defeat and the end of the war, indicate that whatever Chomiak had been doing for the Germans became a fresh issue of interest to the Polish authorities in the mid-1960s. The first document (left) is dated April 23, 1966. It confirms that Chomiak was a target of interest and search, and that part of his German war record had been recovered for a Polish review. His last known address was given as an apartment in Cracow. The search notice was signed by the head of Department C; that’s the intelligence branch of the Polish police; C stands for identification and archives. There is no mention of the purpose for which the information on Chomiak was being gathered, or what triggered the police interest in Chomiak in Warsaw in the spring of 1966. The second document, originally dated May 12, 1966, reveals the search for Chomiak led initially to a case of mistaken identity. Another Michael Chomiak was found, but he turned out to have been born the day before the target, and was a peasant, not the professional editor in chief and administrator. The second note reveals also an official date stamp at the bottom for February 11, 1980; as well as a notation along the left side dated March 3, 1980. By then Chomiak was in retirement in Canada; he had just four years left to live. The Polish police appear not to have been able to follow the German Army records which moved westward in 1945, along with Gassner and Chomiak, when the Soviets advanced on them. Nor until recently has the Polish Government realized that Chomiak ended up in Canada, and that the principal heir to his wartime Galician operations has become foreign minister in Ottawa.